Tools to Grow Your Acupuncture Practice | Jasmine Software: New EMR. Old Paper Notes. 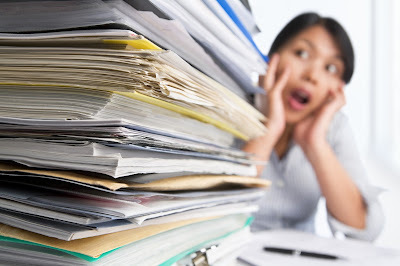 A frequent question and anxiety that comes up when an acupuncturist starts with Jasmine Practice Management and EMR/EHR functionality is, "What do I do with my old paper notes?" I can see why this might cause some anxiety, a practice, that's been in business for several years and has several patients, has a large collection of patient contact information, SOAP notes, intake forms, privacy statements, etc. The thought of having to convert all those paper documents over to electronic form is overwhelming, however, starting with a new EMR/EHR need not be. The recommended approach is to start fresh from a clean slate and as you see patients, enter them into the new system. This allows you to organically grow your electronic records without the burden of the old paper files weighing you down. Using a new EMR/EHR should be an exciting and pleasant experience that gives you super human powers to work more productively and efficiently. When the past says, "Hello"
As your returning patients see you again, you may need to refer to your old paper files. And as you pull those paper files from storage, it's a great time to scan those documents and and store them electronically. You can attach any file type to a patient's contact record, in Jasmine, so you can scan old patient files as PDFs or images. Over time, all your paper files will be converted to electronic form and securely stored. And those old paper notes can be tossed out!